Launched in 18 countries across four continents this month, the Projects Abroad Global Shark Campaign comprises a worldwide awareness and action movement centered on the plight of sharks. 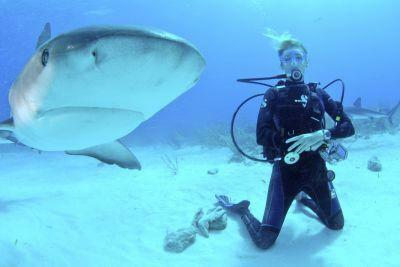 More than 100 million sharks are killed every year by the greatest predator on earth – man. Sharks are used for their fins, flesh, cartilage, liver oil, skin and even their jaws and teeth. The international fishing industry and negative media are driving sharks towards extinction. If sharks are to survive globally, they need all the help they can get. The campaign aims to spread the word about the threats to and misconceptions about sharks to as many people as possible across the globe. Projects Abroad volunteers as well as any other individuals or groups who are interested are supplied with shark-related educational resources to bring the issue to the attention of everyone from members of fishing communities to school students. A petition to ban the sale of shark fins (which hopes to garner in excess of 20 000 signatures) also forms a cornerstone of the campaign. A key part of the project, Projects Abroad’s hands-on Shark Conservation Project in Fiji involves dive certification, tagging of baby sharks, shark identification and shark count surveys. Volunteers also work on shark finning issues, marine park and shark protected zoning, local education programs, mangrove reforestation work and a shark nursery habitat project.